Spider-Man costumes for sale! 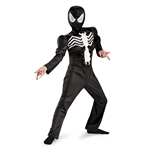 Black Spider Man costumes, classic Spiderman costumes (from the comics), movie Spider-Man costumes; even muscle-chest Spider-Man costumes for the webbed avenger in your family. 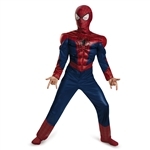 Whether for day-to-day play or Halloween, Spider-man costumes are sure to be a hit. Classic Red and Blue Suit is back The cutest little hero on the block. The Amazing Spider-Man returns!